The Battle of the Somme has become synonymous with slaughter. On the opening morning alone nearly 20,000 British and Commonwealth soldiers gave their lives. A further 40,000 were wounded. The First of July 1916 is often referred to as the blackest day in the history of the British Army; but you could easily go further. From this distance it seems like the blackest day in British history full stop. The idealistic best that the volunteer New Armies had to offer were sacrificed on the bristling German wire, halted in their tracks by an uncounted host of enemy maschinengewehre, bravely manned by gun-teams driven mad through six days and nights of relentless bombardment. It was a tragic end to a great adventure. The 16th Royal Scots were in the worst of it. 'Edinburgh’s Finest', they called them – Scotland's 'Sporting Battalion' and the first of the so-called 'Footballers' battalions. But most folk knew them simply as 'McCrae's'. They were named after their charismatic founder, Lieutenant-Colonel Sir George McCrae, who stood on a recruiting platform on a chill November evening in 1914 and invited the young men of the city to join him. 'I cannot ask you to go', he told them, 'if I’m not prepared to share the danger at your side.' It was an unforgettable moment. This website records the story of this wonderful battalion and explains how the Somme memorial to the 16th Royal Scots, originally proposed in 1919, took eighty-five years to complete. 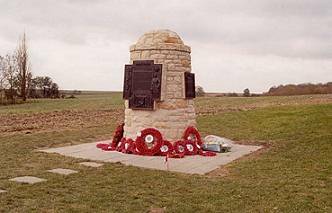 The 'Contalmaison Cairn' is the most ambitious battalion memorial to be built on the Western Front since the 1920s and has now become something of an international phenomenon, inspiring an annual ceremony of Remembrance and drawing visitors from across the globe. It’s a fitting tribute to Sir George and his lads. On behalf of McCrae’s Battalion Trust, I bid you welcome and hope that you enjoy your visit.